I'll have to admit that 2011 was a huge year for me, but just not in terms of brewing. We purchased a new house back in March/April, which sapped up the lion's share of my free time. Additionally, in November I left the job I had been at for 6 years for a new opportunity at a different company. With all this going on, my brewing efforts seemed to get the short end of the stick. Compared to prior years, my numbers were down (25 and 19 batches brewed in 2009 and 2010 respectively). From an equipment standpoint, this year saw no real major brewery upgrades either. There was actually a bit of a downgrade to be truthful. My fermentation freezer (stand up freezer with a digital temp control) did not make the move with us. This now leaves me with only with a temp-controlled chest freezer to ferment as well as house the tap system. This poses a bit of a problem as all the kegs have to come out of the freezer for 1-2 weeks when I am fermenting a new beer. Homebrew Competition Medals Earned: 5 Medals - Silver, Boston Homebrew Comp (Belgian Golden Strong); Silver, Ocean State Homebrew Comp (Irish Red); Bronze, Boston Homebrew Comp (Midnight Wheat); Bronze, Boston Homebrew Comp (Ordinary Bitter); Bronze, Ocean State Homebrew Comp (Standard Cider). Favorite Brew: Ordinary Bitter - besides being a great drinking beer and winning a bronze medal, this beer was selected by my homebrew club to represent it at the AHA's battle of the bitters. What made this so special was that Tom's club sent his bitter to represent their club as well making it a Unique Situation for us. 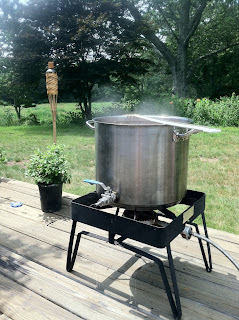 Least Favorite Brew: American Pale Ale - not because the beer came out poorly, but this was the second beer in a double brew day resulting in a very fatigued brewer.